Designing a distinctive exhibition stand, that not only makes your business stand out, but creates a strong impression, can be complex. Space restrictions teamed with vast numbers of exhibitors, can limit your visual impact and make it difficult for you to get noticed. It’s imperative that your exhibition stand channels a “wow-factor”, to be instantly recognisable and create a strong impression. Whilst I’m sure you've heard it many times, first impressions really do count, especially when it comes to attracting exhibition traffic. Your company may well offer a superior product or service, but if you have little or no visual appeal, potential customers could steer away from you into the hands of your competitors. Before you start designing anything, set goals. Think about what you want to achieve and the message you want to get across with your exhibition stand. You could design a great looking stand, but if it fails to convey your company’s values or clearly express your product or service capabilities then you’ve wasted your time. Always keep your goals in mind throughout the design process and you won’t lose your way. Often booth size can be restrictive so it’s important to fully utilise the space you’ve been allocated. Make sure to confirm dimensions with the organisers so you know exactly what you have to work with. Improve the flow of your display area by ensuring there are no physical obstructions or barriers on entering, and try to keep meeting areas to the back of your stand. Although many exhibition stands have a maximum head height, some larger venues have an extremely high floor-to-ceiling. It’s worthwhile to check if there’s a maximum stand height, because if there isn’t, the ceiling’s the limit! 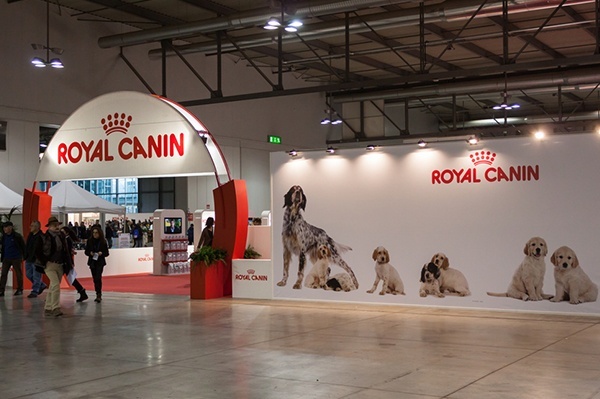 Maximise visibility by incorporating high signage, suspended props, or incorporate a tower with a rotating sign so you catch attendee’s eye from the moment they enter the exhibition and attract them to your stand. Often, less is more, and when it comes to text on an exhibition stand, it certainly is the case. Concision is key. Avoid using long sentences if single words will convey the same message, because no one will not stop to read lengthy copy. Use a slogan that people will remember after the event on your signs, rather than lists of product information that few people will pay attention to. Be sure to use a font that is clear and big enough to be seen from a distance. Location of text is also important; place your text on the top half of your exhibit stand so that it is not blocked by people in your display area. TIP: Keep your messaging short and sweet- Action verbs can work particularly well. 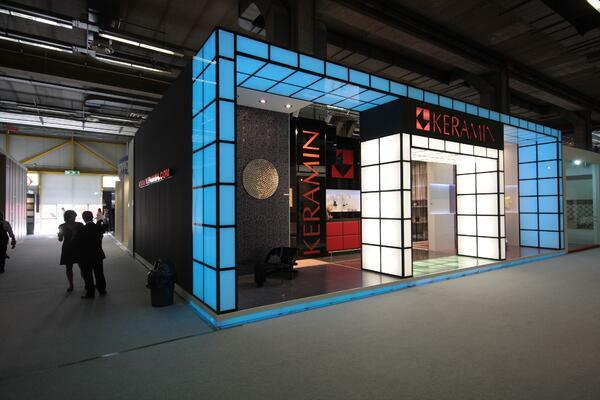 An aspect that’s often overlooked, is lighting, which plays a very important role in the design of exhibition stands. Lights enhance aesthetic appeal and if used correctly, can create different moods and ambiance depending on the desired outcome. For example, a company that’s showcasing new tech, might want to use recessed lighting; giving a contemporary feel to coincide with a new modern product. Consider additional lighting and don’t rely on what’s supplied by the venue. Spot lights, up lights and coloured lights are also a great way to highlight certain areas within your exhibition stand, particularly if you want to showcase something in particular, such as a new product. TIP: Subconsciously entice attendees into your stand by using angled light boxes at the entrance to draw them in. 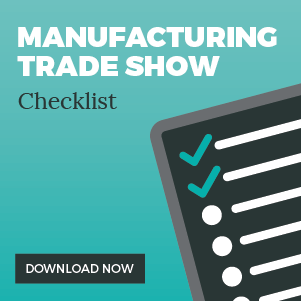 Download→ Plan and prepare your next Manufacturing trade show using our 3-page checklist. As the old saying goes, “a picture is worth a thousand words”. According to Microsoft1, we now have a shorter attention span than a goldfish. Images and graphics are a quick and effective medium to communicate a complex message or idea instead of reams of text. Similar to the text placement, carefully consider where you put your images; Make sure they can be seen from a distance and they won’t be concealed. TIP: Make a serious impression by using life-sized images- these are particularly powerful. Don’t be afraid to experiment with materials. By making the right choice, you will reinforce your image and create a stand design that will attract your target market. Are you in the tech industry? Perhaps you want a contemporary design and feel- brushed aluminium panels or chrome detailing could be a good choice. Smooth, plastic mouldings are also a great way to create a modern, clean feel. A good option for those in the pharmaceutical or medical industry. 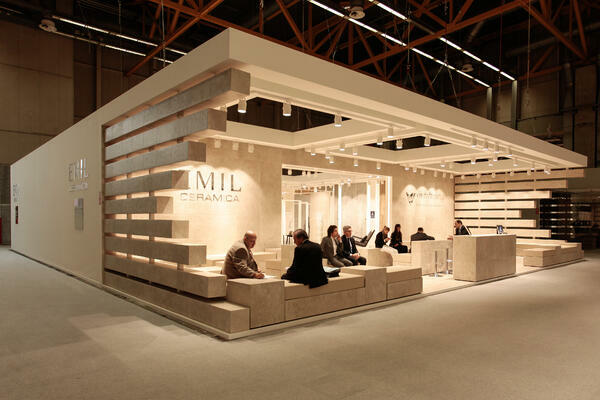 Emil Ceramica (below) were very creative with their materials, and made their stand from their own product. Technology now plays a huge role in our day-to-day life, so why would you not include it in your trade show stand? But how can you include tech? Product demos are a huge part of trade shows, as they allow you to get your product right in front of your target market. Take the opportunity to showcase a live prototype e.g. 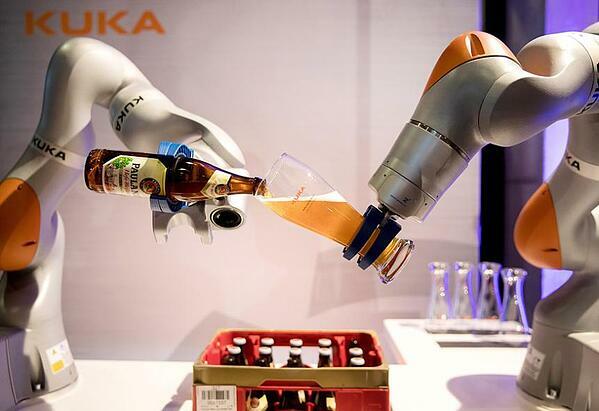 an automation firm could showcase their products by creating a robotic barman who could serve refreshments to attendees. If you sell bulky product that would be otherwise impossible to get to the show, why not create a demonstration using virtual reality (VR)? Touch screens and interactive walls provide visitors with a fresh, new experience by putting them in the driver’s seat and allowing them to interact with your multimedia content on their terms. Visitors can explore your “story” and manipulate elements, such as enlarging or rotating images, playing videos and clicking on text and links. People no longer want to be spectators – they want to be participants. Interactive multimedia displays will be a standard feature in all trade show booths sooner than later. Build a complete atmosphere within your exhibition stand. Use a combination lights, textures, colour, layout and even scent. By stimulating the senses of your prospects you will attract more attention and stand out against your competition. Identify your target audience and always keep them in mind during the design process. If you know who you are “talking” to, you can focus your concept on their wants and needs; this will form a base for the best way to communicate your message and present your product or service. The most aesthetically pleasing exhibition stand might look the part, have all the bells and whistles, but if your target audience haven’t been considered, you could be attracting the wrong prospects and ignoring the right ones. 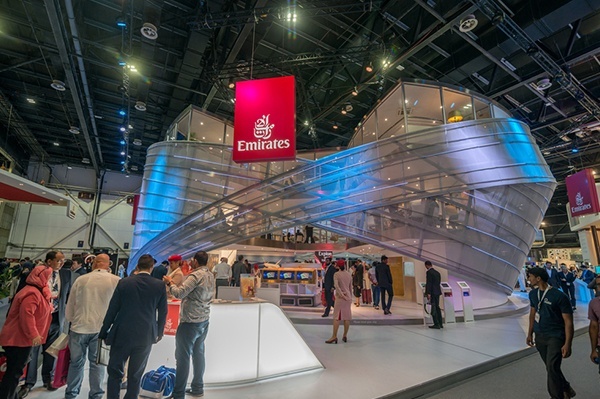 By taking each of these tips into consideration for your exhibition stand design, you should be on track for a successful trade show.